Mud Crab are a member of the family Portunidae. 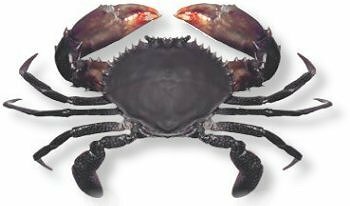 They are large crabs with a smooth, broad carapace and possess sizeable claws used for crushing and cutting prey. The two hind legs are flattened for swimming. Mud Crab are generally very dark brown to mottled green in colour. Juvenile's feed on planktonic animals, benthic molluscs and crustaceans while adults feed on bivalve and gastropod molluscs (mussels and pipis), small crabs and polychaete worms. Mud Crab can reach a maximum size of approximately 24 cm carapace width and 3.5 kg in weight. Mud Crab inhabit tropical to warm temperate waters from Exmouth in Western Australia up and along the coastline of the Northern Territory and Queensland to the Bega River in southern New South Wales. They favour soft muddy bottoms below the low tide level and generally live in sheltered estuaries, mud flats, mangrove forests and the tidal reaches of some rivers. Crab traps or pots baited with meat or fish are used to catch Mud Crabs.